Product #15946 | SKU IPHONE-ADAPT-1 | 0.0 (no ratings yet) Thanks for your rating! The Sescom 30.5 cm iAdapt iPhone/iPod/iPad TRRS Plug to TRRS Jack Adapter Cable is a short extension adapter cable that allows larger accessories with a standard 3.5mm TRS or 3.5mm TRRS accessory to connect with your iPad, iPod or iPhone through case holes down to 9 mm across. 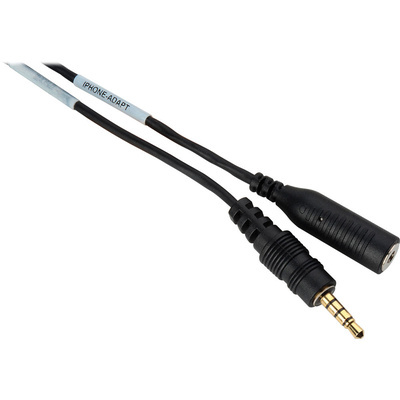 This adapter cable works with many cases that have a smaller headphone/mic interface, adapting them for use with peripherals like POS card readers and audio-visual accessories. The iAdapt was designed with shielded audio cable and it affords clear passage of left and right stereo audio, as well as microphone input audio. The cable also reduces the wear and tear that inevitably occurs from repeatedly plugging and unplugging cables into and out of your iPad, iPhone and iPod headphone/mic-in jack.